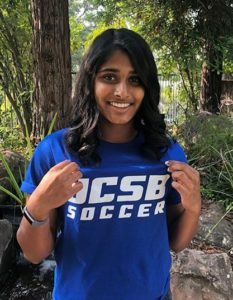 “I am so excited to announce that I have verbally committed to further my academic and soccer career at the University of California, Santa Barbara! I’m thrilled that I was able to find a school that will push me athletically and academically. First and foremost, I’d like to thank my parents who’ve always taught me to be the best version of myself. They’ve spent countless amounts of time and energy to support me through doing what I love. I would also like to thank my sister who has been my best friend and outlet throughout my life. During my four years at Placer, I’ve been surrounded by an amazing environment that supports and pushes me. I’d like to thank my coaches Ron Benjamin, Don Finley, and Katie Burton who have all shaped me into the player that I am. Additionally, I’d like to thank all of my teammates, throughout the years, who’ve truly become some of my closest friends.